SHF #11: Espresso semifreddo with almond florentine - Do You Know The Muffin Man? This is my contribution to SHF #11, hosted by Ronald at loveSicily, and the theme is coffee. I'm not a regular coffee drinker (caffeine on an empty stomach makes me tremble!) although I enjoy a cup once in a while. However, the aroma of coffee and its use as a flavouring is something that I love. I thought of a photograph of a coffee cup made out of ice cream from an old magazine and dug out the recipe for Espresso Semifreddo served on an Almond Florentine. Gusto!, a food magazine, is no longer published by the Globe and Mail but I fortunately have a handful of old issues. This recipe came from the Summer June 1997 issue. 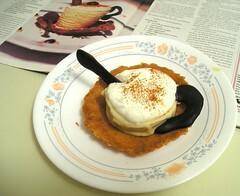 The recipe's only coffee component came from the extract (as well as the shape of the dessert!) so I knew I wanted to boost the flavour some more. Taking some whole coffee beans, I crushed them and let them infuse in half the whipping cream overnight. To the egg yolk and sugar mixture, I added ½ tsp of instant espresso powder. During a shopping trip at Whole Foods, I couldn't find any white chocolate other than the Lindt Excellence Natural Vanilla so that's what I used. While microwaving it to melt it, the chocolate developed a hot spot on the inside and ended up caramelizing. It wasn't totally burnt so I just stirred in the brown bits which had the side effect of adding a mocha colour to the cream mixture. The semifreddo is pretty simple to make, although it does require a lot of bowls. For the florentines, by warming the butter until it was almost melted, I found it much easier to blend with the orange juice. Keeping the theme in mind, I substituted Kahlúa for Grand Marnier. The disks really spread out in the oven, so I could only bake six at a time. Using a tart mold as a makeshift cookie cutter, I made rounds and draped them over saucers and the bottom of some mugs. They harden quickly so you have to shape them while they're still hot. Assembly was a bit of a problem. First, I forgot to keep the florentines in an airtight container so they softened. A quick trip in the toaster oven followed by another cooling re-crisped them. Secondly, the semifreddo didn't freeze very solidly in the espresso cups and they melted very quickly in the warm kitchen. This led to a very flat and saddened appearance to the whole dessert. My tasters kept calling them teapots! You can see what it's supposed to look like in the background of the photo. But, of course, taste is paramount and this dessert delivers. The “cup” is smooth and rich, with a wonderful coffee flavour punctuated by bits of caramelized white chocolate. The almonds give a nice crunch to the “saucers” and the orange flavour is quite noticeable.